When the British adventurer Sir Humphrey Gilbert landed in what was then the Spanish territory of Florida in 1583, he recorded in his journal that he found “parrots” there. These were about the size of a common blackbird, with bright green bodies and yellow shoulders, yellow heads, and orange faces. By 1731, collected specimens of the Carolina Parakeet had reached England, where they were described by the London naturalist Mark Catesby, and given the Latin namePsittacus carolinensis by Linnaeus in 1758. At first, naturalists in the US did not pay much attention to the Parakeets, preferring to focus on the less common species. A few published descriptions pointed out that the Carolina Parakeets lived in flocks of two or three hundred individuals, that they preferred dense forest along river valleys and swamps, and that they nested in hollow trees, laying two or three round white eggs. The fledgling birds were pure green. Over the years, it was recognized that there were two distinct populations, separated from each other by the Appalachian Mountains. The western population had duller colors and was more bluish than green, and it was placed in the subspeciesP.c. ludovicianus. It wasn’t until 1891 that an Italian biologist, working with mounted specimens in the London Museum, undertook a thorough study and concluded that, while the Carolina Parakeets were related to the conure group of parrots, they differed in some respects. He reclassified the birds in their own genus, Conuropsis (meaning “like a conure”). By now, however, the once-common birds had become a rarity. In colonial times, the large flocks of brightly-colored loudly-squawking birds were conspicuous everywhere. Like the conures, the Carolina Parakeets were brash, intelligent and sociable, and they soon became popular as cage birds, where they often lived as long as 35 years. Although they apparently bred readily in captivity, there were so many for the taking in the wild that nobody bothered to raise them. One group of people, however, resented the birds. The Carolina Parakeets were seed and fruit eaters, and the large flocks were attracted to agricultural fields of corn, wheat, grapes, and apples. Farmers considered them as harmful pests, and often resorted to hiring shotgun-toting hunters to destroy the flocks; although the birds were worthless as food (it was reported that the Parakeet’s flesh was made toxic by some of the poisonous seeds it fed on), large numbers were shot. Farmers also inadvertently wiped out entire local populations by cutting away the bird’s cypress/sycamore habitat to clear more land for planting. Some ornithologists have concluded that the birds were losing hollow-tree nesting sights to non-native honeybees, which were often introduced for agricultural purposes. By the 1830’s, bird specialists, including James Audubon, were noticing that the Parakeets could no longer be found in many areas where they had once been common. By 1860, only a few Western subspecies populations could still be found in swamp areas of Louisiana, Georgia, Alabama, and Mississippi. Eastern Carolina Parakeets could still be found in large numbers in Florida, until the 1880’s, when it became fashionable for women to wear elaborate hats decorated with colorful bird feathers. By 1900, millions of Florida birds, especially herons and egrets, were being killed for their feathers–and the brightly-colored Carolina Parakeet was included. The Parakeet was particularly easy for hunters to collect because of the flock’s instinctive reaction to gather around birds that had been injured or killed. By 1920 the practice of shooting birds for their feathers had been outlawed, and it seemed as though the Carolina Parakeet would be saved. But the population continued to decline–perhaps, it has been speculated, as a result of an epidemic disease introduced from captive poultry. The last known Carolina Parakeet outside of Florida was collected in Kentucky in 1878. In 1904, a Parakeet was shot by an ornithologist near Lake Okeechobee in Florida; it was the last confirmed sighting in the wild. On February 21, 1918, the last surviving captive Carolina Parakeet, a male named “Incas”, died in the aviary at the Cincinnati Zoo (where, ironically, the last Passenger Pigeon had died four years earlier). Sporadic sightings continued. In 1920, a local resident in Florida reported seeing a flock of about 20 bright green and yellow parrots, but there was no confirmation of the identification. In 1926, the University of Florida’s Curator of Birds, Charles Doe, reported seeing three pairs of Parakeets in Okeechobee County, but again there was no confirmation. Ten years later, a birdwatcher and an ornithologist both saw what they concluded were Carolina Parakeets in the Santee Swamp in South Carolina. In 1955 a home movie was submitted, reportedly shot during a 1937 trip to the Okefenokee Swamp in Georgia, that showed three parakeets, but orithologists concluded they were escaped non-native pet conures. Since then, there have been no confirmed sightings, and the Carolina Parakeet was declared “extinct” in 1939. Recently, however, the Carolina Parakeet’s place in the wild has been occupied again, by a close relative. 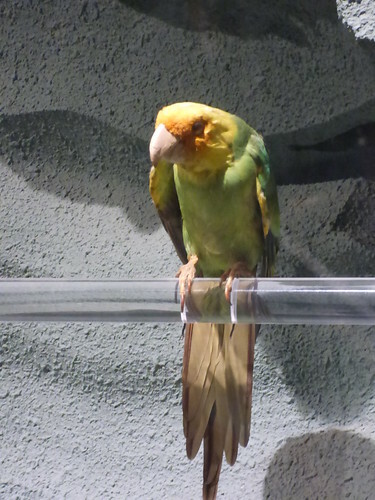 In 2012, biologists were able to extract a DNA sample from a museum taxidermy display of a Carolina Parakeet, and compare it to living members of the parrot family. The results indicated that the extinct Parakeet’s closest living relatives are the Sun Parakeet, the Golden-Capped Parakeet, and the Nanday or Black-Hooded Parakeet, all from South America. One of these, the Nanday, has long been a favorite in the pet bird trade, and a population of non-native escapees has now established itself in Florida, where it lives happily in the area once inhabited by its now-extinct cousin.